Following the council outlined in a recent statement from the Church, we have decided to discontinue our Book of Mormon Cruises and our Book of Mormon Tours. Join us for an amazing cruise to some of the ancient Mayan ruins in Mexico and Belize. These Mayan cities date back thousands of years and show evidence of the cultures, religious beliefs, and traditions which are also found in the Book of Mormon. We are going to tour the sites with the Book of Mormon in mind. The Book of Mormon will come alive in ways you never imagined. It will become so real to you that your desire to read and study the book will increase. While on board the ship, enjoy several lectures relating to Book of Mormon geography. Learn why many believe that Mesoamerica is where the Book of Mormon took place and why understanding the geography of the Book of Mormon matters. Witness the Book of Mormon come to life and return home with a renewed desire to make the Book of Mormon a centerpiece of your life. Read what others are saying about our Book of Mormon Cruise! Visit the ruins of Tulum (the Temple of the Descending God) and Lamanai, snorkel in Grand Cayman, and spend a day on the tropical island of Roatan. Join Tom Pettit and other LDS guides for an unforgettable Book of Mormon cruise to the ancient Mayan ruins of Mexico and Belize. Ruins of Chichen Itza, Tulum and more! Stay at an All Inclusive resort in Cancun, Mexico. See the very best of the Mayan world without staying on a tight cruise ship schedule. Visit the amazing ruins of Chichen Itza, Tulum, Coba, and Ek Balam. Visit Cancun’s highest rated eco-archaeological park. 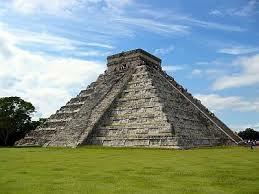 Majestic Chichen Itza is now one of the Seven Wonders of the World. Tulum over looks the Caribbean Sea and is home to the Temple of the Descending God. Join Tom Pettit and other LDS guides and speakers for an Ultimate Book of Mormon adventure!